This is a sermon I gave at G3 Fellowship on April 28, 2013 on Mark 12:13-17. It goes beyond the traditional message about the tribute to Caesar and shows the importance of literary as well as historical context in understanding the meaning of a passage, especially in the gospel accounts. The outline below is complex for a sermon (more a teaching outline) and I learned not to use such a complex one again – keep it simple, right! Sometimes we need to make mistakes to really get the point. Regardless, it is provided below to highlight my main points. P.S. 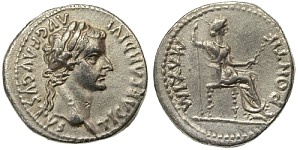 I know there is some controversy about whether the denarius presented to Jesus was the Tiberius denarius or the Augustus denarius, but since Tiberius was the ruling Caesar, I am convinced it was most likely the Tiberius denarius. That detail is not really important to the story because either Caesar represents the authority of the Roman government. Thus, I did not discuss this. CTT: Mark wrote Mk 12:13-17 to show that God is the ultimate wise ruler and the things of this world have their proper place under His rule. In God’s wisdom, the religion will be taken away from Israel and given to direct heirs throughout the world.